Garage band: You know what this means. You know what this sounds like. Momzer doesn't sound like that. But they've been playing in each other's garages, and each other's parents' garages, and some garages they rented, and a couple basements of people they barely even knew, and some living rooms when spouses and upstairs neighbors were insanely understanding and no garages were available, for years. So. Momzer is a garage band. Indie band: You know what this means. You probably have your own idea of what indie bands sound like. Momzer doesn't sound like that. Or, sometimes they do, a little. It's been a running joke with the band's family and friends for all this time. Mark spent his non-Momzer formative time in a dance/party band, Rex is a Portland punk scene vet, guitarist Jonas likes synth pop and piano-player Glen tends towards guitar bands. So all of them draw ideas from each other and sometimes even try to sound like some of the people they listen to and still wind up sounding like Momzer. Early on they all decided they didn't want to be rock stars. These days they're still springing music on anyone who'll listen. 'Cause they love it a lot. So. 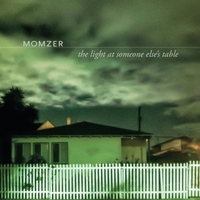 Momzer is an indie band.